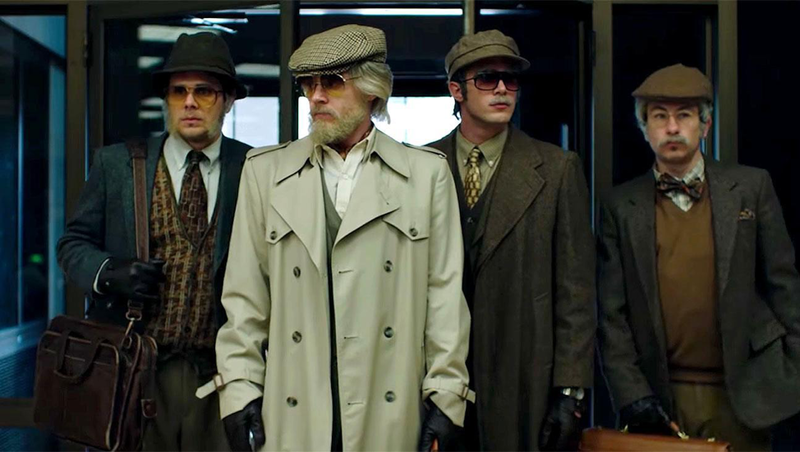 To say that American Animals has a complicated relationship with reality would be a fair assessment. From the jump, we are told that this both is and is not based on an entirely true story, which I kept in mind as the narrative unfolded before me. Going in blind as I did, I was unaware that the broad-strokes plot was indeed a true story. In 2004, four college students from Kentucky robbed the Rare Book Room at Kentucky's Transylvania University, making off with an original copy of Charles Darwin's On the Origin of Species, and oversized folio editions of some collections of John James Audubon's paintings, among other things. The overall value was estimated then at around five million dollars. They attempted to have the pieces appraised at New York's famous Christie's Auction House and were shortly thereafter arrested and the books returned. Spencer (played by Barry Keoghan) is the idea man and the audience's entry point into the story. An aspiring artist from a well-off family, Spencer feels his life lacks some specialness necessary to facilitate great art. The heist is his answer; a defining moment which will give him the perspective he lacks. It's whiny, privileged 20-something ennui at its most overt. When he floats the idea to Warren (Evan Peters) an anarchic small-time criminal who seems especially keen on shaking up his life, Warren immediately takes the plan from a 'what-if' to a 'why-not'. The two engage in "Blockbuster Video research"; renting every possible heist film from the local video chain, getting stoned and taking notes. The two end up casually shuffling their way into meeting a fence in New York and eventually an interested buyer in Amsterdam before realizing, as Warren puts it, "We're gonna need a bigger boat". They end up adding brainy misanthrope Eric (Jared Abrahamson) as their logistics man and highly self-motivated Chas (Blake Jenner) as the getaway driver. All four performances are really very engaging. Peters is an obvious scene-stealer, playing Warren almost like Spencer's id (or his Tyler Durden, as they'd likely think of it), contrasting well with Keoghan's performance which is mostly all quiet tension. Chas mainly comes off as overconfident, but Jenner gives a truly standout performance when that cocky veneer cracks near the film's end. My favorite character, however, is Eric, who Abrahamson plays with a prickly and amused cynicism. The cast plays well off of each other, giving an enjoyable one-upmanship dynamic to various group scenes. Similar to last year's I, Tonya, these performances and the larger narrative they support are intercut with documentary-style interviews with the involved parties. Unlike I, Tonya, however, these are not actors speaking in-character, but the men themselves (they're even credited as "the REAL Spencer Reinhard", "the REAL Warren Lipka", etc.). There are even moments where the actor and the man he's portraying interact briefly. In one instance for example, Warren waits in the car while Spencer goes inside a convenience store and for a moment is joined in the car by the REAL Warren Lipka. "Is this how you remember it?" Peters asks the REAL Warren. "Not exactly, but if this is how Spencer remembers it, let's go with that". Bart Layton, American Animals' director, has a history in the documentary genre and clearly carried over all the tools at his disposal. The interview asides support the reenactments well and do a good job early on (along with the opening "This is not based on a true story" title card) of establishing the idea that we may be dealing with unreliable narrators. These elements also lend the whole story a feeling of fun, supported by how generally likable and familiar the guys involved are. You may not have been someone who got really high watching heist flicks and flirted with planning one of your own, but chances are you know someone who did. I had a great time with American Animals, gang! The cinematography by Ole Bratt Birkeland is fantastic and the soundtrack featuring underappreciated tracks from Kiss, Donovan, & Leonard Cohen is truly great. Most impressively, Bart Layton managed to make the heist, and all the prep work that preceded it, feel both carefree and nerve-racking; a difficult tone to maintain. American Animals, in simplest terms, is a film about a bold and bizarre robbery, filled with engaging performances. Through Bart Layton's confident direction it manages to concisely tell a complicated story while manipulating narrative conventions to leave us wondering about the nature of narrative itself, narrators and our relation to truth. Is what we see exactly how it all really happened? I don't think so, but also, I don't think it matters. I had a blast watching American Animals, and I think you will too. But, as the REAL Warren Lipka says at the film's end "I guess you'll have to take my word for it".